Issue XVII Vol. 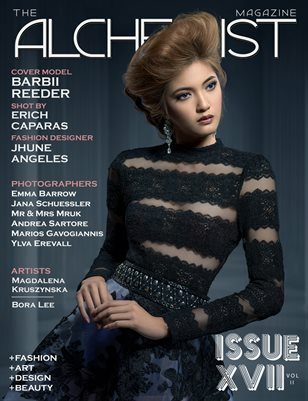 II of The Alchemist Magazine features model Barbii Reeder on the cover photographed by Erich Caparas wearing designs by Jhune Angeles. The issue also features photography editorials by: Emma Barrow, Jana Schuessler, Mr and Mrs Mruk, Andrea Sartore, Ylva Erevall and Marios Gavogiannis. Featured Artists: Magdalena Kruszynska and Bora Lee.